Former Team Bondi head Brendan McNamara says he's not a bully, but he wishes that people who claim he is had the stones to say so to his face. The post-L.A. Noire breakdown of Team Bondi has been well documented but the one man who hasn't had much to say about it, until now, is former studio head Brendan McNamara. McNamara earned himself a reputation as a tyrant and a bully in the waning days of Team Bondi's swan song, which he says contributed to the demise of his studio even though it was unjustified. "We got a lot of bad press about what it was like to work with us and our conditions. That, obviously, didn't come at the right time," he told Eurogamer. And although it was the deteriorating relationship between Team Bondi and Rockstar that left the studio without a publisher or a project, McNamara added that he holds no grudges. "We're all pretty volatile. We had our ups and downs in the making of it. But we're all big boys," he said. "I've known Sam [Houser, co-founder and president of Rockstar Games] for maybe fifteen years. We go a long way. We still talk when we need to. Anything that was part of the process is all water under the bridge to me." 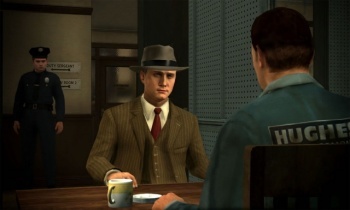 McNamara didn't deny that Team Bondi worked hard fhours during the L.A. Noire crunch phase, but he said he didn't believe that it was any worse than what other major studios go through when they're under the gun, either. He claimed the backlash caught him by surprise and suggested that much of it probably sprang from intense feelings about McNamara himself. "I'm like Vegemite. People either love you or hate you," he said. "And a there's a lot of people who don't like Vegemite." "People are entitled to their opinion. I'm perfectly happy for people to say they don't like working with me or I'm a bully or I'm this or whatever. The part that annoys me is people do it anonymously. I'd rather they just ring me up and tell me to f*ck off, right?" he continued. He also made it clear that he thinks all the anonymity surrounding his detractors was pretty silly. "We had a TV show in Australia, which was showing people who used to work on L.A. Noire with their faces blacked out and their voices changed. I was sitting there thinking, hang on, this isn't the IRA. They didn't enjoy working at the place and they don't like me as their boss. Okay, but we made a videogame. I think we made a great videogame. It was a difficult and terrible process, but nobody died making it," he said. "So I thought that was kind of... where does this end, you know? What we did was make a videogame, and you black out your face and change your voice? If you want to have your five minutes on TV and show your face, I'm cool about it. You can say whatever you like about me." McNamara said he's in the early stages of work on a new project that he's been pitching to publishers for a couple of weeks, and hopes to be able to make a public announcement about it soon.